Ok this post reminds me of a tale I need to tell you from my 7 hour (bus was late and Thanksgiving traffic on 95) bus trip from NYC to DC on Saturday. A couple brought their dog on the bus in one of those fancy dog carrier things. As I mentioned, the bus was late, so we had to stand in line in NYC in the FREEZING cold for over an hour and that's when the dog started "yapping". Not barking. Yapping. I immediately put in headphones once I got on the bus because the yapping was worse than any crying baby or loud talker. What is a small dog supposed to do for the potty on a 7 hour bus trip you ask?? The man owner took the dog to the bus bathroom about 5 times on the trip. I have NO clue what he did with the dog in the bathroom or how he knew when the dog needed to use the potty and I don't want to know. 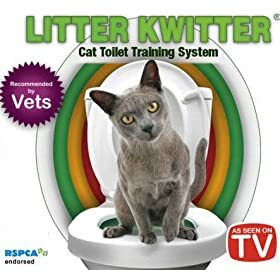 Maybe they had the dog version of the Litter Kwitter.